Wall Mount Bear Shape Address Plaque - - If your home or business is located in bear country or you're a city dweller with a soft spot for bears, then this wilderness theme bear silhouette sign is the one you want for your building. Made in USA. Wall mount 12" x 8.5" bear can hold one or two lines of personalization. The one-line address sign holds up to four (4) 3" characters. On the two-line sign, each line holds up to eight (8) 1.25" characters. Customized with your choice of color and address you specify. Dimensions: 12"W x 8-1/2"H x 1/8". 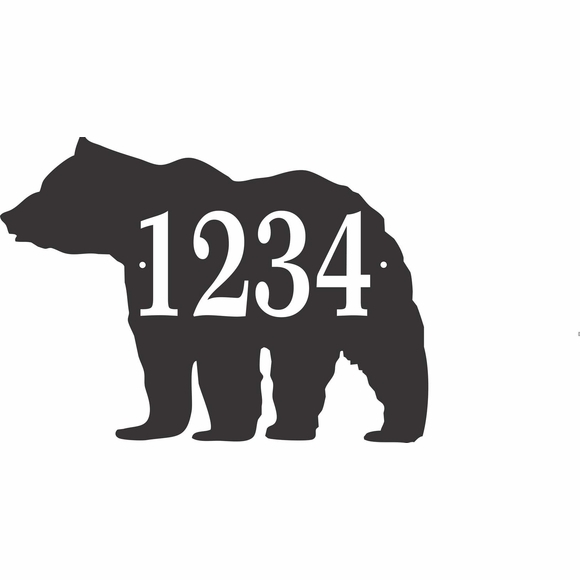 Address sign in the shape of a bear crafted in the USA. Click the links in Related Products to see more bear products and special shape novelty signs. Note: when you order it in white with black characters it looks like a Polar Bear. See image above.